John is returning to Adventure Treks for his third season as an instructor. 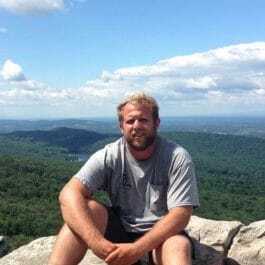 He has worked in China as an outdoor educator, run a fishing company in the Florida Keys, and was a trip leader with Ohio University outdoor pursuits. Jon is a Wilderness First Responder and holds a captain’s license. Why is working for Adventure Treks important to you? It’s a positive communal experience that I value greatly and want to work to improve for others! What excites you the most about working for AT this summer? The opportunity to help others have empowering experiences in amazing locations. What do you do when not working for AT? I like to ski, travel, and visit family. Favorite outdoor memory? Spending time in Yosemite National Park!